It’s Easter week and we’re on a quest to find cute Easter crafts and recipes! Today, I found this adorable cupcake recipe on Disney’s Babble site and thought I’d share! Enjoy! Preheat the oven to 350 degrees, butter the mini muffin tins, and line the cups with paper. With a mixer or beaters, beat the egg whites until they form soft peaks. Spoon the egg whites into a small bowl and set aside. Next, combine the flour, baking powder, and salt in a medium mixing bowl and set aside. In the same bowl you used for beating the eggs whites, beat the butter until it is light and fluffy. Add the sugar and beat for two more minutes. Next, beat in the egg yolks one at a time, and add the vanilla. Put your mixer on low, add half the milk and half the flour, and then the other half of the milk and the other half of the flour. Then, add half the eggs whites and mix just until combined. Fold in the second half and mix gently with a spoon or spatula. Spoon the batter into the muffin tins, filling each cup 2/3 3/4 of the way full, depending on how big you want the cupcake to be. Bake for about 20 minutes, or until the cupcakes are a light golden color and a toothpick inserted in the center comes out clean. Cool cupcakes completely and then frost. With a mixer on medium speed, cream the butter until it is light and fluffy, then slowly add the sugar. Once the butter and sugar are fluffy and smooth, add 2 tablespoons of lemon juice, the food coloring, and the vanilla extract. Test the flavor and add more lemon juice if you’d like. 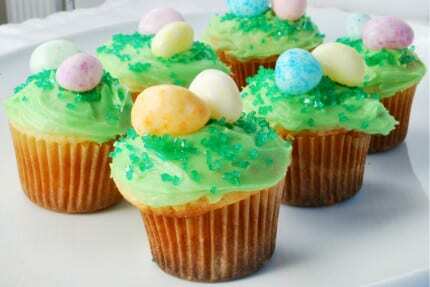 Frost the cupcakes, add sprinkles, and place two candy eggs on each. Happy Easter Everyone! This recipe tells you to butter cupcake pan and Then use cupcake papers. That would be messy. Do one OR the other!